Flea uses the tried and true formula of the GHS Bass Boomers that the world has counted on for decades. 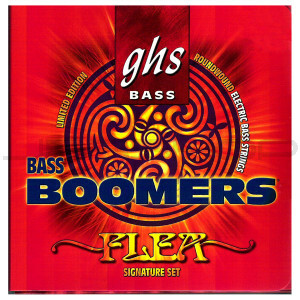 GHS Bass Boomers are a Nickel Plated Steel wrap wire with the low E string. The unique Boomer hex core gives this string added strength and power. The Red Hot Chili Peppers count on Flea to provide that hard driving bottom end and these strings are a crucial part of that signature sound. "I've always used GHS Bass Boomers and I'll never change."